Carbonated water was an 18th century invention in England, associated with the brewing of beer. Fizz came in just over a hundred years later in New Orleans, when carbonated water was added to a cocktail of gin, lemon, lime, egg white and sugar, stirred. After years of trying fizzy drinks from the US, the Russian drinker appears finally to have decided enough is enough, at least for bubbles. Coca-Cola is discovering that its growth in Russia now depends on its Russian branded juice beverages, while sales demand for Coca-Cola-branded products appears to be declining. In Coca-Cola’s global accounting, Russia is counted, not in Europe, but in Eurasia and Africa. But whether European or Eurasian in taste, Russia stands out as the largest declining sales market for the company worldwide – down 5% in sales overall, and down even more if Coca Cola’s most recent takeover of the Nidan juice company is excluded from the accounting because it is so recent. If Coca-Cola hadn’t bought Nidan last September, the decline in Coca Cola branded drinks would have been 11% for the quarter. For the year to date, the growth in Russia is in the takeover of a non-carbonated fruit juice company, Nidan. For a company which spends several hundred million dollars each year on advertising pitches, the news from Russia isn’t quite what the company means by its current slogan, “Life begins here.” Indeed, the shift in Coke’s Russian slogans last year takes on new meaning. From “Всегда Coca-Cola” until 2009, the new slogan, “Coca-Cola идет в дом!”, suggests that Russian consumers are taking something quite different home, and it’s not called Coca-Cola, nor does it taste remotely like it. Coca-Cola is more talkative about the market trends in western Europe,, where they are the reverse of the Russian drinking trajectory. 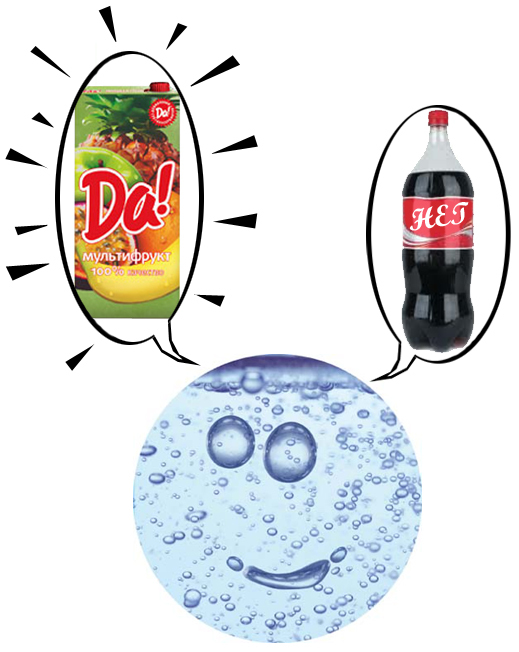 In Germany, France and Great Britain, the company claims that branded Coca-Cola fizzy water is on the upswing, and still beverages are going down. When asked to explain what the company thinks is happening to the fizz in Russia and why, Coca-Cola in Moscow said that it only answers questions once a fortnight. The company’s press secretary was reported to be “on a business trip and out of reach.” When asked for the name of Coca-Cola’s spokesman in Russia, the company source said “corporate policy” doesn’t allow that. A placement in Interfax last week puts the blame for Coca-Cola’s dismal performance on the weather. “The company attributes the slump in the third quarter to the high base figure of last year, when sales in Russia shot up 30 percent in July-September due to the unusually hot weather.” Another way of putting this is that unless there is a heat wave in Russia, and the fields are literally burning up, Russians won’t drink Coke to quench their thirst — if they can have a Nidan product, or kvass, or water instead. The takeover of Nidan was first announced in March 2010. At the time, Reuters reported Vladimir Kravtsov, Coke’s Moscow spokesman, as saying: “We are interested in buying Nidan”. Reuters claimed that Coca-Cola already owned the local Multon beverage brand, and that with the addition of Nidan, its beverage market share would jump to almost 40%, ahead of PepsiCo, whose Russian beverage and bottling company is Lebedyansky. Coca Cola bought a 75% stake of Nidan from the London-based private-equity company Lion Capital, with the remaining 25% held by Nidan’s founders – Igor Shilov and Leonid Shaiman, and their Hungarian partner Chaba Baleyr Layosh. Nidan claimed to have a 17% share of the all-Russia beverage market; 43% in Siberia. Juice production and packaging plants are in Moscow region and Novosibirsk. Distribution extends throughout Russia to the Ukraine, Kazakhstan, Kyrgyzstan, Belarus, Mongolia, Uzbekistan, Moldova, Georgia and Armenia. If Nidan’s sales went down by $90 million (33%) between 2006 and 2009, the weather cannot have been to benefit or to blame. Lion’s tone hints that it may have taken a bath on its Russian beverage investment. Lion may have done much better on its investment in vodka producer, Russian Alcohol (Zelenaya Marka), which it says it bought from Sergei Generalov’s Industrial Investors holding in July 2008, and sold in December of 2009. Generalov, whose record for transparency isn’t famous, doesn’t mention the sale of anything to Lion Capital, nor does the website of Russian Alcohol, which continues to be a Generalov-controlled investment, according to Generalov. Central European Distribution Corporation (CEDC), a NASDAQ-listed and SEC-regulated company, has a very different tale to tell about its purchase of “62.25%” and “control of Russian Alcohol” from Lion and from an entity called Cirey Holdings, “a private company domiciled in the British Virgin Islands and the ultimate controlling party of Russian Alcohol”. If Cirey is or was a Generalov company, and if the Generalov website’s claim to control Russian Alcohol reflects shares he received in CEDC, those involved aren’t saying exactly. Officially, Industrial Investors acknowledges that it withdrew from the capital of Russian Alcohol about a year ago; there is no explanation why the holding website suggests otherwise. But let’s go back to soft drinks. Coca Cola didn’t tell the Russian press what it was paying for Nidan last year, and there were estimates in the press that the amount was $450 million, including Nidan’s debts. Coca Cola told the SEC, in a Form 10-K report dated February 28 of this year, that “total consideration for the Nidan acquisition was approximately $276 million, which was primarily allocated to property, plant and equipment, identifiable intangible assets and goodwill.” A report in Kommersant in September of 2010 reported a Nidan source as hinting that the company’s debts may have been as high as $150 million. How could Shilov and Shaiman have borrowed and spent so much money in the three years they were under Lion Capital’s control, only to generate such dwindling revenues? Perhaps they leveraged Nidan’s assets to spend on something more delicious than fruit water, and then presented Coca-Cola with a bargain it couldn’t refuse. The Russian Federal Antimonopoly Service (FAS) reviewed the takeover in line with the competition and concentration criteria of Russia’s anti-trust regulations, and in September 2010, issued its approval. Yevgeny Izotov, a spokesman for FAS, confirmed approval of the deal, but he refuses to release the FAS analysis of its impact on the beverage market. The sector and investment analyst acknowledges that the heat-wave in the summer of 2010 helped to revive demand for soft drinks, especially after the low-base effect in 2009, when reduced real income, following the 2008 crash, cut consumer spending. But neither the weather nor the economic cycle is driving the Coca-Cola financial performance. So that appears to be the Russian secret Coca-Cola wants to keep secret. After the novelty wears off, Russians don’t like Coke much. In this respect, their palates are almost unique in the civilized soft-drinking world. And so, for Coca-Cola Company to continue showing profits in the Russian market, the company has concluded that it must buy up Russian juice companies, and sell something different from Coca-Cola.